Hornos Industriales Pujol developed its “Fast Curing” Automated EVA Laminating Line with a high-speed convection oven as the new standard in high production laminating. The production line manufactures laminated glass with EVA interlayers, reducing manufacturing cost and increasing quality compared to traditional autoclave production with a PVB interlayer, according to Pujol officials. The new “Fast Curing” line laminates 6 millimeter by 6 mm tempered safety glass in 40 minutes. Designed for continuous loading and unloading of the oven, the production line is a truly automated system with high-production capability, Pujol officials report. The Automated EVA Laminating Line offers fabricators several advantages over a traditional autoclave system, including lower energy consumption, lower overall cost and improved production. A traditional autoclave production line consumes energy from storage/handling requirements, the clean room, dehumidifier, and climate control system, and requires additional energy to run the autoclave and nip roller. 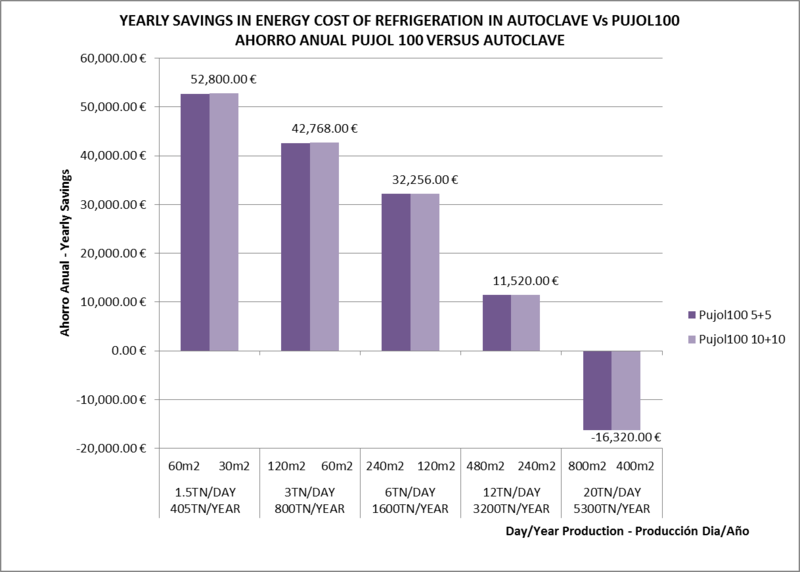 Because of the high energy consumption, an autoclave line must produce large volumes to cover the costs of production, and is unable to easily accommodate non-standard production schedules, according to Pujol officials. On the other hand, the automated “Fast Curing” EVA Laminating Line from Pujol can produce both high and low production requirements at stable energy cost, Pujol officials report. Pujol’s automated “Fast Curing” EVA Laminating Line is capable of profitably manufacturing as little as 50 square meters per day to over 1,000 square meters per day, depending on the size and capacity of the oven. This translates to faster turnaround to the customer (regardless of demand) and flexibility to the manufacturer. Additionally, due to controlled pressure exerted on the glass edge via vacuum bag, the EVA laminating line reduces the number of interlayers by 50 percent in laminated tempered glass, using only a thickness of 0.76 mm EVA compared to 1.52 mm in traditional autoclave production. “By continuous development of our EVALAM brand of EVA, we are able to pass safety certifications equal to those of PVB using less interlayer material,” explains Pujol. The investment in an automated EVA "Fast Curing" laminating line is approximately 25 percent of a traditional autoclave oven with nip roller and climate room system, Pujol officials report. Combined with drastically lower energy consumption and labor costs, Pujol’s line offers a faster, smaller amortization cost per square meter. View a cost savings chart here.